Along with the proposed ban on so-called “assault weapons”, there is legislation in progress to limit magazine sizes. Does this make sense? First, let’s define just what a magazine (sometimes incorrectly called a “clip”) actually is. 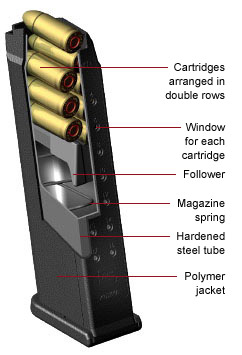 A magazine in a firearm is where the ammunition is held ready to load and fire. Most pistols and so-called “assault weapons” use a removable magazine that holds a number of cartridges — typically between 5 and 20, sometimes up to 30 or more for rifles. When all the cartridges have been fired and the magazine is empty, it can be removed from the gun and replaced with a full one. With practice, changing the magazine takes only a couple of seconds. Why would we limit magazine sizes? Suppose a deranged gunman is shooting unarmed folks around him. Using 30-round magazines, he would have to switch magazines after every 30th shot. Using 10-round magazines, he would have to do this after every 10th shot. I suppose there’s a bit more opportunity for the unarmed bystander to tackle and subdue the shooter, but that would take incredible guts, skill, and luck. Would you run at the shooter in those few seconds? With one killer against a flock of innocents, magazine size is not much of a factor. But why not limit them anyway, just in case it helps? Surely nobody needs more than 10 rounds for self defense! Well, don’t be so sure. Suppose — God forbid — two big guys with knives and a nasty dog work your door open and charge on in. Your kids are in the next room and here come the bad guys: how many shots will be enough? It’s right now you want extra capacity, rather than coming up empty. In this scenario, magazine size is quite important. It’s about having a reserve in case the worst happens. For multiple armed assailants. Ask any cop if they’d like to have a 10-round limit. It’s like having a parachute that’s “probably good enough”. No sir. If you ever need it, it had better be plenty. The bottom line is that magazine capacity doesn’t make much difference in a mass slaughter of unarmed innocents. But when defending against armed and determined criminals, it can mean everything. The gun-control folks will take away anything that we let them take.